"Our vision is to create the world's most competitive enterprise." 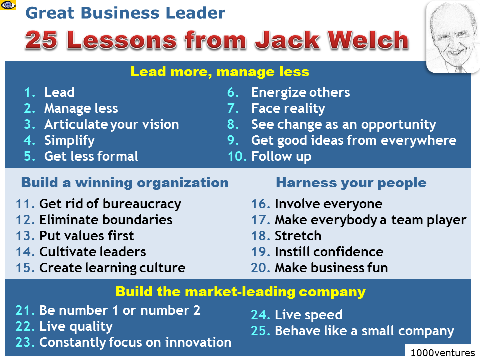 Jack Welch's goal was to make GE "the world's most competitive enterprise. Today, GE with its unique learning culture and boundaryless organization is one the most admired company in the world. The techniques and ideas that Welch has employed to move GE forward are applicable to any size corporations, small, medium, or large. "We are constantly amazed by how much people will do when they are not told what to do by management." In the new knowledge-based economy, people should make their own decision. Managing less is managing better. Close supervision, control and bureaucracy kill the competitive spirit of the company. "Weak managers are the killers of business; they are the job killers. You can't manage self-confidence into people." Face reality, then act decisively. Most mistakes that leaders make arise from not being willing to face reality and then acting on it. Facing reality often means saying and doing things that are not popular, but by coming to grips with reality would things get better. New ideas are the lifeblood of business. "The operative assumption today is that someone, somewhere, has a better idea; and the operative compulsion is to find out who has that better idea, learn it, and put it into action ‒ fast." Follow up on everything. Follow-up is one key measure of success for a business. Your follow-up business strategy will pave the way for your success. In order to make sure that people are free to reach for the impossible, you must remove anything that gets in their way. "Boundarylessness" describes an open organization free of bureaucracy and anything else that prevents the free flow of ideas, people, decisions, etc. Informality, fun and speed are the qualities found in a boundaryless organization. Cultivate leaders who have the four E's of leadership: Energy, Energize, Edge, and Execution; leader who share values of your company and deliver on commitments. Turn your company into a learning organization to spark free flow of communication and exchange of ideas. "The desire, and the ability, of an organization to continuously learn from any source, anywhere - and to rapidly convert this learning into action – is its ultimate competitive advantage." Business is all about capturing intellect from every person. The way to engender enthusiasm it to allow employees far more freedom and far more responsibility. Create a truly confident workforce. Confidence is a vital ingredient of any learning organization. The prescription for winning is speed, simplicity, and self-confidence. Self-confident people are open to good ideas regardless of their source and are willing to share them. "Just as surely as speed flows from simplicity, simplicity is grounded in self-confidence." "We want to change the competitive landscape by being not just better than our competitors, but by taking quality to a whole new level. We want to make our quality so special, so valuable to our customers, so important to their success that our products become the only real value choice."